In a VR experience, you are put into a virtual world as someone who physically consumes space. Depending on the content, you can go from an observer to an influencer, where consumption of the virtual space and the content is totally up to you. You can choose what to observe, and follow each movement in multiple angles at your own speed -- you shape your own experience and consume the space and time differently than any other viewer. It is no surprise that fewer millennials are going to theatres to watch movies. Nielson and MPAA have reported a decline of 15 to 17 percent in number of movies watched at movie theatres among 12 to 24 year olds. While there may be many factors involved in this such as millennials' different consumption patterns and the rise of Netflix, studies have shown that the age group might be more interested in a new medium such as virtual reality. In fact, the VR society -- whose members include Walt Disney Studios Motion Pictures, Warner Bros., The Virtual Reality Company, DreamWorks Animation, and Sony Entertainment to name a few -- has shown in its first survey of 1000 consumers that 72% of 18 to 29 year-olds, followed by 70% of adults 30-44 were "excited about experiencing VR", a large portion of them more excited about VR than HDTV and 3D. As more people turn to their headsets than movie theatres, VR is quickly becoming filmmakers and studios' favourite medium for experimentation, especially movie marketing. Already, two Oscar-nominated movies -- "The Martian" and "The Revenant" -- have created immersive and engaging experiences that give movie fans the chance to become a movie character themselves, as they get stranded on Mars or survive a bear attack. Given the constraint that premium VR content can only be watched on headsets, many may ask the question, 'Why choose VR?' especially when there are so many touch points and tools today that marketers can leverage to grab our attention. But VR extends the life value of movies like no other medium can and can create powerful, emotion-driven experiences for movie fans. Below are some ways that VR differentiates itself from others in the movie marketing arsenal. In cinema and theatre, the fourth wall is a metaphor for an invisible wall that separates actors from the audience. The fourth wall is the plane through which we see the action, while the convention traditionally assumes that the actors are only engaged within a box set or a frame, unaware of the fourth wall. Breaking the fourth wall refers to any moment that this convention is challenged -- when a fictional character displays awareness that they are in such work like a play or a film, that character is "breaking the fourth wall". Most familiar and common example would be when Frank Underwood from the show "House of Cards" directly looks at the camera and talks to the viewers. Taking one step further, the fifth wall is a concept of the plane perpendicular to the fourth wall. Instead of being constrained to the four walls of a conventional box set, breaking the fifth wall will allow fictional characters to move beyond the box set and engage with viewers in dimensions. Of course, breaking the fifth wall is impossible when watching on a screen, but virtual reality is just the right tool that can fuel this phenomenon. Fictional characters can literally step out of the screen to directly engage with viewers. This means that viewers can now share an experience with fictional characters, create a human bond and a real relationship. What VR allows is something way beyond the flat screen. Being able to explore several layers of narrative, context and character directly will allow a deeper understanding, building a deeper bond between the viewer and the movie or a character. The relationship that a viewer shares with a fictional character will last far longer than the screen time, and in the viewer's mind, the special moment that they shared with a character will live on for as long as they can remember. This way, VR extends the lifespan of a movie, giving a second life to these fictional characters and a platform for them to live on. In a VR experience, you are put into a virtual world as someone who physically consumes space. Depending on the content, you can go from an observer to an influencer, where consumption of the virtual space and the content is totally up to you. You can choose what to observe, and follow each movement in multiple angles at your own speed -- you shape your own experience and consume the space and time differently than any other viewer. This is extremely important for movies with much action or focus on the detail of movement as a flat screen cannot capture the fluid and flowing motion of objects or characters. In VR, movement and motion carry much more impact than in regular or even 3D movies because we, by default, believe that what we see is real. When you are watching a movie on a screen, you are trying to ignore the fact that all the action is happening behind a screen and that none of it is real. Instead, in VR, the default setting is belief. As Chris Milk explains, "with virtual reality, you're essentially hacking the visual-audio system of your brain and feeding it a set of stimuli that's close enough to the stimuli it expects that it sees it as truth. Instead of suspending your disbelief, you actually have to remind yourself not to believe." In fact, a study done by Medium with the help of Stanford University claims that audiences who were completely immersed in the scene (360-degree viewing) were more aware of the tone of the piece and also more attuned to the character's feelings compared to audiences who viewed the scene in 90 and 180 degrees. As Medium wrote, 360 degrees is much more than a full circle as the environment resonates with the viewer. All these combined, VR works great to create a halo effect around the movie itself. Because VR converges storytelling and game-like aspects to create a specific, personalized experience, each individual's VR trial becomes a story worth sharing with friends. This is extremely valuable in today's day and age as social media is a natural way of "sharing", and an essential marketing platform. It perfectly taps into audience's, especially millennials', desire to share their experiences as according to a study done by Nielsen: To attract the 12 to 24 year old age group, "social media, social experience" becomes necessary. Nielsen also reported that two-thirds of this population discuss movies on social media networks. In other words, as Cinemablend puts it, "young people aren't going to the theaters unless it is something they can tweet about or find a Facebook event for." We can already see many successful examples of VR as an effective marketing tool. For instance, Paranormal Activity has created a VR game which helped increase awareness and affinity of the horror film franchise. The Conjuring 2 created a trailer-like VR experience, and it has garnered over 5.5 million views on Youtube. Even Netflix has joined in on the VR craze, making a virtual reality/360 video for "Stranger Things" which fans were very excited about. On top of the response that these videos and games generate themselves, the number of reaction videos, tweets, social media shares, all contributes to the craze and hype that attribute to the movie franchise. 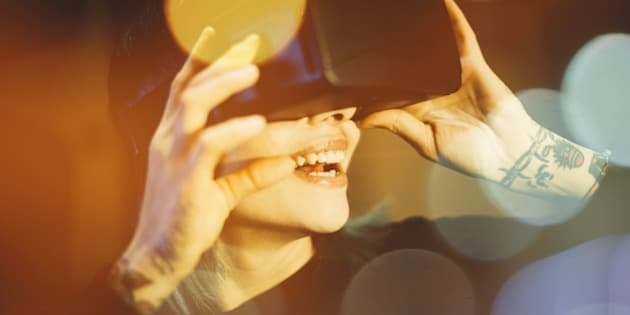 VR can be a very useful source of many additional contents such as the making of the video, behind-the-scenes, reaction videos, and these all help to build the halo effect that all marketers hope for.